The second stop on the 2017 American Grown Field to Vase Dinner Tour played to a sold-out crowd at Gallup & Stribling Orchids in Carpinteria. The magical evening included a tablescape and hands-on workshop with Debi Lilly of A Perfect Event – and of “Oprah Winfrey Show” fame. Guests enjoyed a farm-to-fork meal by Rincon Beach Club & Catering’s chefs Ron True and Jose Garcia. Craft spirits were provided by Cutler’s Artisan Spirits, and Captain Fatty’s Craft Brewery provided the brew. The dinner was also accompanied by wines from Magerum Wine Company. Debi Lilly of A Perfect Event. Photo by Linda Blue Photography. 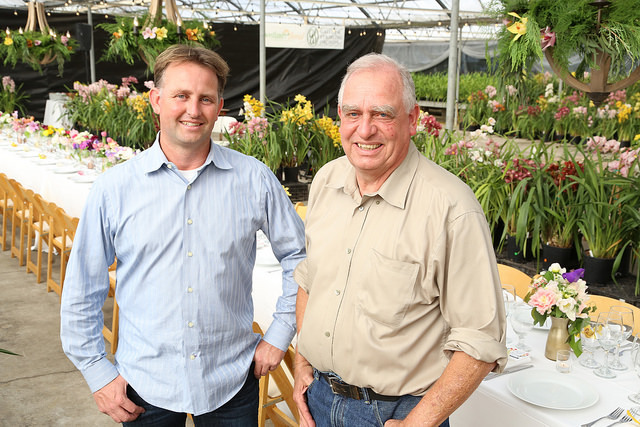 Certified American Flower farmers and father-and-son duo Alex and Case Van Wingerden provided an hour-long tour of their farm to guests who wanted that extra time and experience with the flower farmer discussing orchid growing and answering questions. See more beautiful photos from our dinner in Carpinteria here. 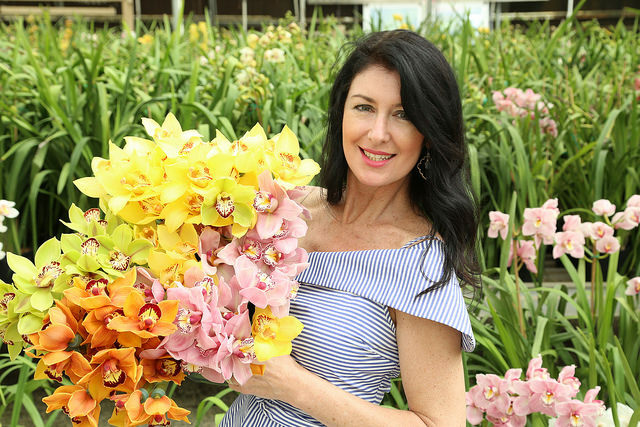 Alex and Case Van Wingerden of Gallup & Stribling Orchids. Photo by Linda Blue Photograhy. The third stop for the American Grown Field to Vase Dinner Tour was The Flower Fields in Carlsbad. 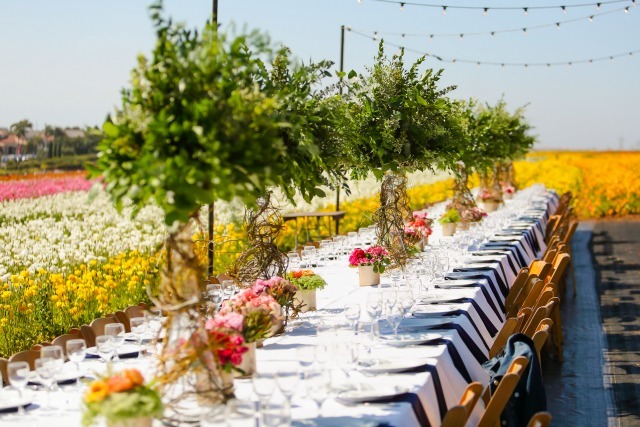 Held among the ranunculus fields, the event included a tour with flower farmer Mike A. Mellano and a hands-on design workshop with “The Flower Chef” Carly Cylinder, who also designed the breath-taking tablescapes. This stop attracted our largest crowd in the history of the dinner tour and they were wowed by the blooms, the informative farm tour, the artisanal meal and the spectacular weather that greeted them. 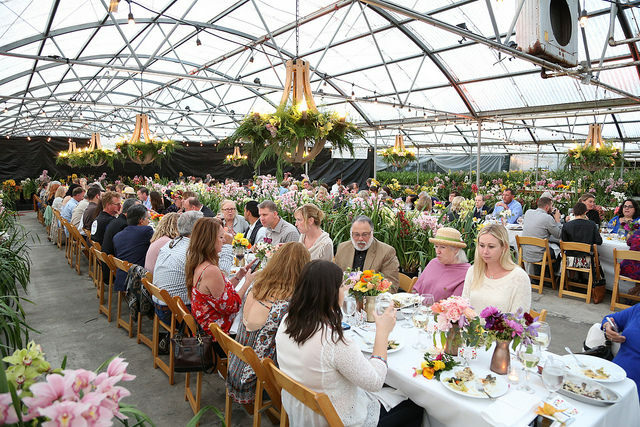 In addition to our popular Facebook LIVE videos, the dinner garnered lots of media attention, helping spread the word about America’s flower-farming families and why origin matters. Read more about our Carlsbad dinner here. The dinner tour stops next in Washington, Pennsylvania, June 24. 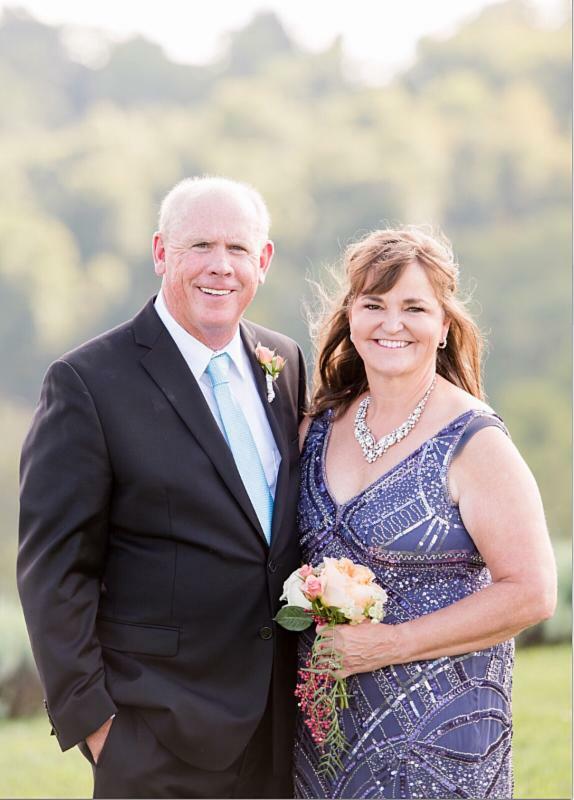 Join us at Destiny Hill Farm where you’ll meet flower farmers Jim and Nancy Cameron who transformed their family’s farm into a lush lavender, cut flower and berry farm in 2011 and became a Certified American Grown flower farm in 2014. Floral designer Francoise Weeks of European Floral Design willadorn the dining table with woodland-inspired centerpieces featuring branches, buds, seedpods, succulents, herbs and seasonal flowers. 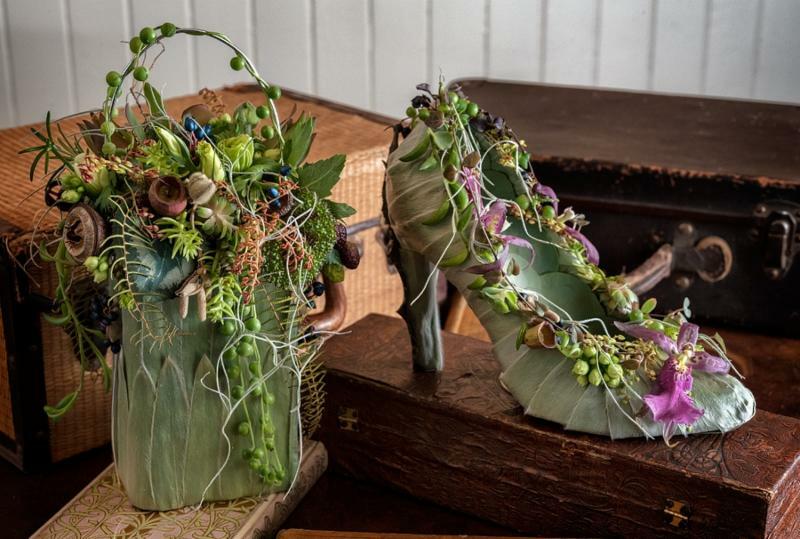 Known for her unique use of floral materials and awe-inspiring designs, Francoise’s global perspective will elevate this event to a new level. Tickets for this unique experience are going fast. Save your seat today! Thinking about going to Alaska for the Field to Vase Dinner on July 29th? Sign up for exclusive travel tips to help inspire your peony adventure!